What do you do when you don't have pierced ears and you have a love of 60's style earrings? Make your own! Frankie doesn't have pierced ears, which is practically unheard of right? She loves the big colorful vintage clip-ons but they're few and far between and the really good ones are a mint! 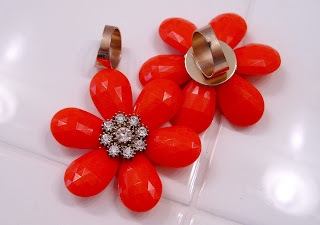 Picked these two rings up at Forever 21, big, fun and colorful! All I did was pluck off the ring and glue on the earring backs! Won't that be a fun surprise in the Easter Basket? So that's not completely all I did yesterday but it was the highlight? What about you? Housework and errands... but I did Channel my creative side. I built a spreadsheet...LOL! Most craft stores carry the clip-on type earring backs. You can snip the post from a pierced style with wire cutters or a dremel tool and epoxy the clip on in its place. Pretty easy, and it gives you far more options. Darn it!!!! I just missed you at the Farmstand event. Did you see the pics I posted of it??? Fun! It turned out to be a great day and I got to reconnect with so many old and new "on line" friends. She's gonna be so happy to see those! I was sick yesterday--so I'm making up for lost reading time online. I didn't get my ears pierced until I was 26. I hope she's not reading this! Yeah- won't Frankie see these? Great idea and really cute!! By the way, I just got my issue of The Quilt Life today!! I am super excited. A great picture of you and Elizabeth. I am going to read it from cover to cover. I took a sneak peek of your article. How cool is that? Congrats for being a contributor! I have Frankie's phone number. I can txt her at any time. Hand over the slice of Emil pie. What is Forever 21 Pam? 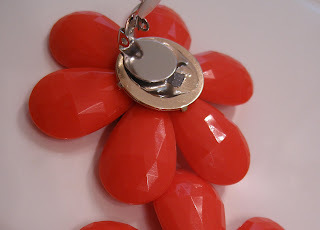 I just adore those beautiful earrings and red is the color I wear the most...Your blog always makes me very very happy. You have a great sense of style and color and I love your bags.